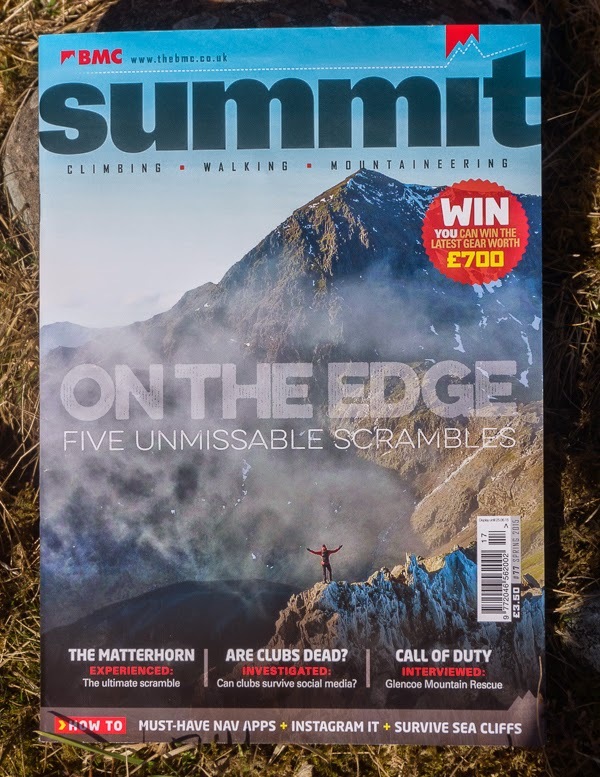 It’s two and a half years ago since I last wrote about using smartphones in the hills in one of my most popular posts. Then my aim was to counter the arguments against using smartphones and tablets as GPS units. The same arguments still surface today and I think my piece is still valid. I’m not returning to that here however but to the question of how appropriate such technology is in the hills and whether it can be a distraction. I’ve been thinking about this since reading a fascinating blog piece by author Alex Roddie entitled Ditching the infinity machine– five months later in which he describes swapping his smartphone for a basic phone after becoming concerned that the former was spoiling his enjoyment of the wilds. After this experiment Alex has returned to his smartphone but he now uses it in a different way so it’s far less intrusive. Most of my walking having been done before smartphones existed (and much of it before mobile phones) the options for distraction from the wilds came down to just one – a book. And I carried plenty, often several at a time. Mostly I read in camp in the evening, especially when the weather meant staying in my tent was wise, (and I sometimes left rather late in the morning because I spent too long reading over breakfast). But sometimes a book gripped me enough that reading it became more important than where I was and I read while walking, my mind far away from my surroundings. Often though I was reading because where I was walking wasn’t that wild or interesting. I was still cut off from the world around me though and probably missed much. Alex Roddie in his earlier piece on smartphones describes the problem of battery failure with smartphones. Books don’t run out of power. Instead they run out of words. I can remember hoarding the last pages of a book, only reading a few at a time, because I was so concerned about finishing it before I reached somewhere I could buy another. Occasionally I’ve arrived in a town with finding books my main concern above food, showers, resupply or somewhere to stay. 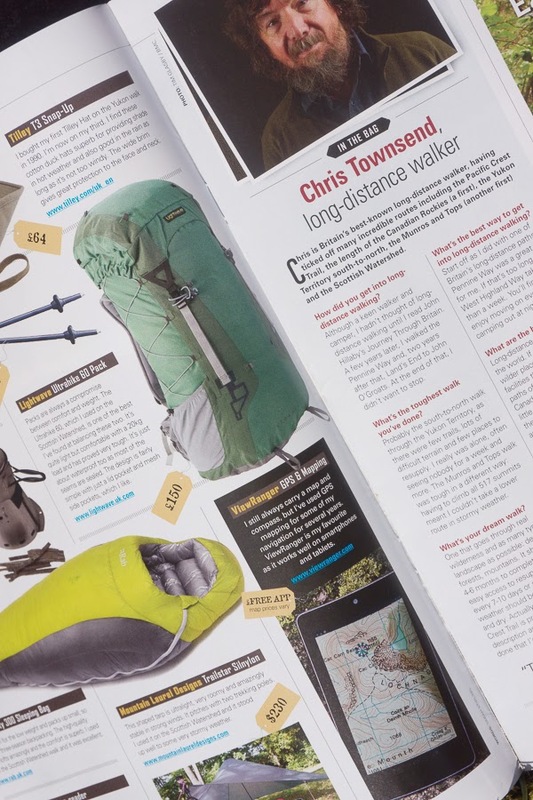 I couldn’t imagine doing a long walk or even an overnight trip without something to read. I still can’t but now I take a Kindle loaded with dozens of books for the same weight as one small paperback. Of course the Kindle can run out of power too but it’s not happened yet, even when I’ve been out for a week at a time. In fact I’ve not yet needed to recharge it from my back-up battery. 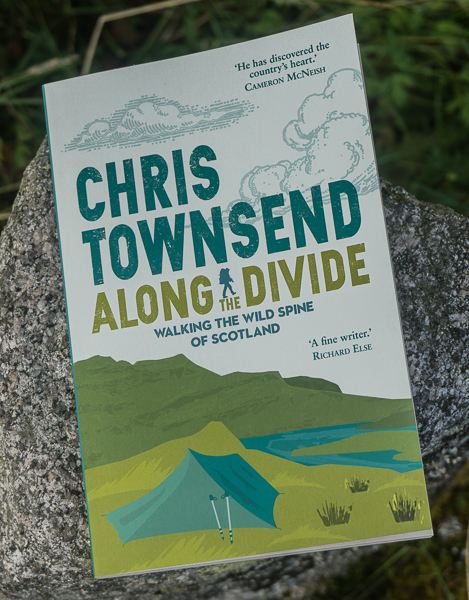 And with the Kindle in a waterproof case I can read in the rain, as I did on a crossing of the Coirrieyairick Pass on a TGO Challenge walk. That’s the roughest terrain I’ve read myself across. Some people go further. 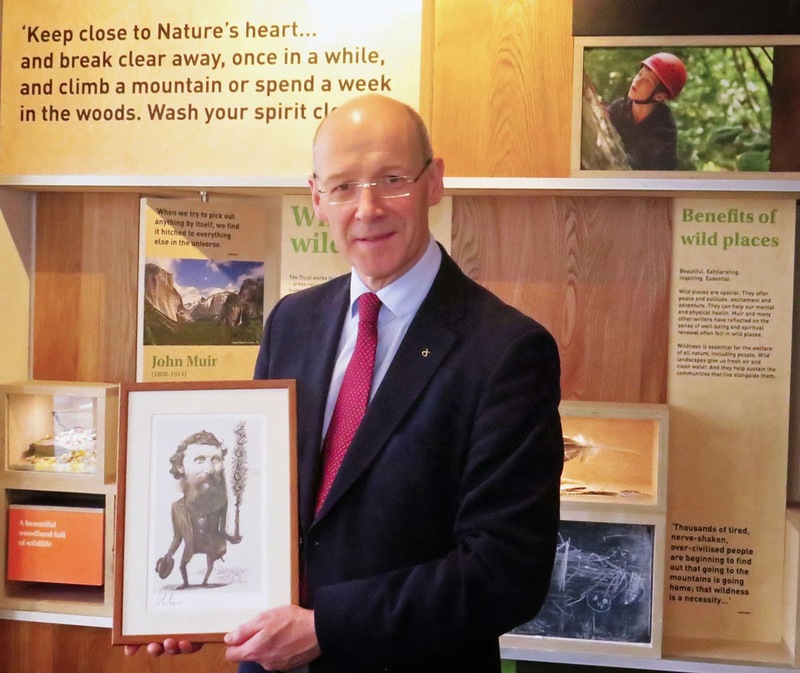 Hamish Brown describes reading a paperback along the South Glen Shiel Ridge in Hamish’s Mountain Walk. 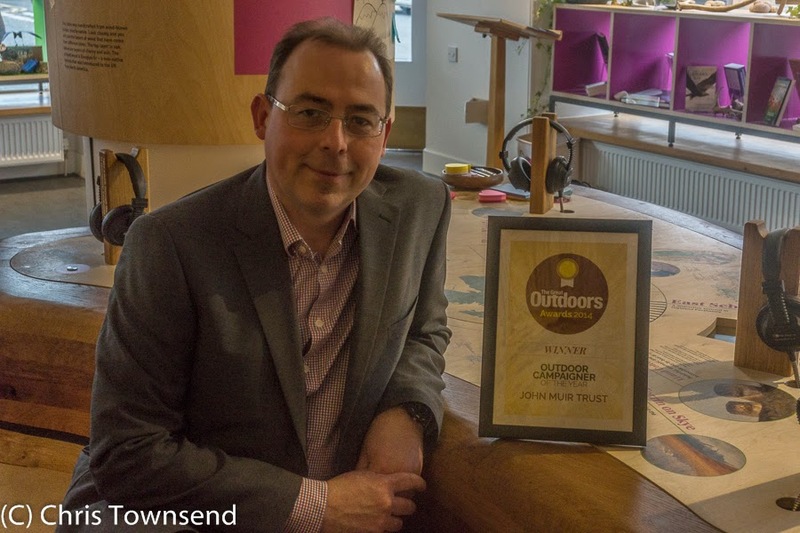 Alex Roddie mentions using his smartphone as an e-reader, saving the weight of a Kindle. 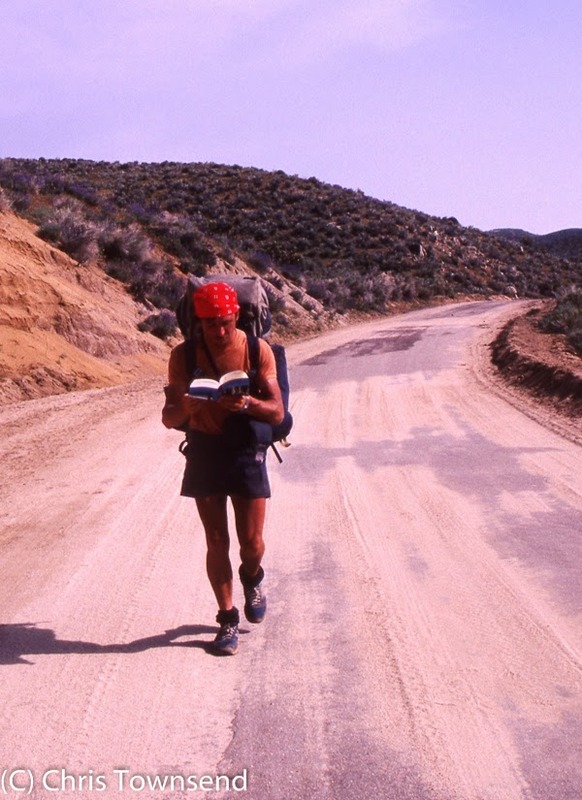 I did this on the Pacific Northwest Trail, before I had a Kindle, but found that it drained the battery too quickly. Given the weights of back-up batteries I reckon it’s lighter to carry the Kindle. Reading on a Kindle is a much more pleasant experience too as the screen is larger and there’s no glare. 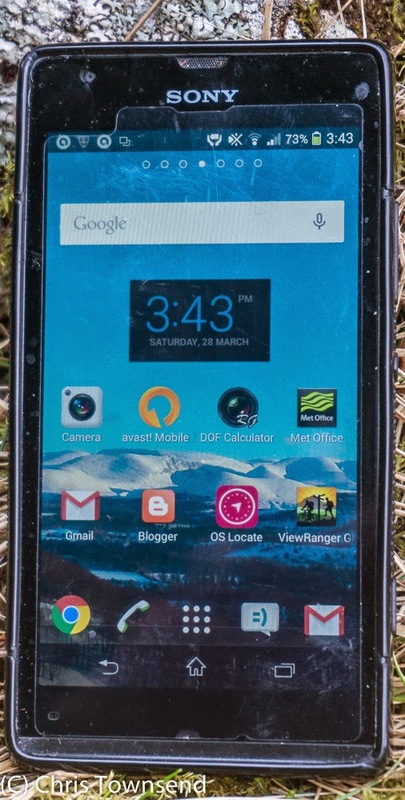 My main use of my smartphone – currently a mid-range Sony Xperia SP, which does everything I need, is quite light (174 grams with protective rear case) and is still small enough to be used comfortably for actual phone calls – is for navigation with ViewRanger. Usually this just means locating my position and maybe walking a short distance to check I’m going the right way so the phone doesn’t need to be on all the time. A secondary use is for photos that I can send to social media before I get home and can download the images from my cameras onto the PC (I don’t have one of the latest cameras that links easily to a smartphone). I also send texts to my partner sometimes during a trip and always as soon as I’ve finished for the day. As I’m usually in places where a phone signal is a rarity (still the case in much of the Scottish Highlands) I’ll upload a photo or send a text and then put the phone back in the pack still switched on, as long as I have enough power. Generally at some point over the next few hours it’ll pick up enough of a signal to send the text and, less often, the photo. I don’t have any notifications or sound switched on so I don’t hear any bings or beeps and can forget about the phone. In camp I rarely look at the phone except to locate exactly where I am if I’ve camped after dark and am uncertain. The Kindle books and writing in my journal are enough distractions if needed. If I've enough power and there's a connection I might check the weather forecast. Occasionally I'll listen to the radio. 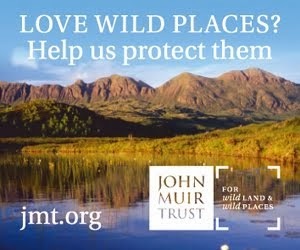 However on long walks the phone always comes into use anytime I reach a town as then I can update my blog, answer emails, check social media and even submit reports to The Great Outdoors, something I did on both my Pacific Northwest Trail and Scottish Watershed walks. How communication technology is used in the hills is up to the individual of course. There are no rights or wrongs. I see no reason not to check emails and social media or even make phone calls if you find it satisfying any more than I can see a reason not to read in the hills (and I have been told at times that it’s ‘wrong’ to carry a book). The key is for you to control it and not the other way round. If it becomes intrusive and you think it’s spoiling your enjoyment the answer is simple. Switch the damn thing off! Spring storms bringing rain and warmer winds had been eating away at the snowpack for many days and winter seemed to be on the wane. Then the weather changed. 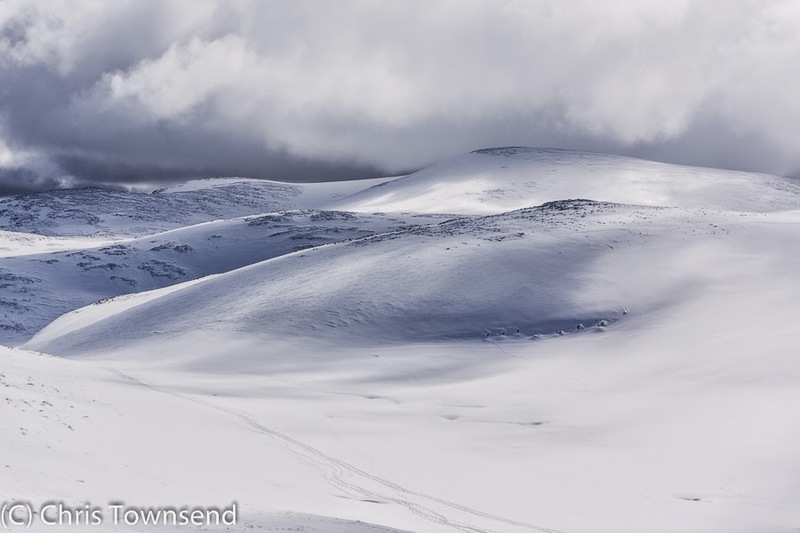 March is usually too early for the end of winter in the Cairngorms and so it is this year. Waking to a heavy frost with the distant mountains coming and going in swirling clouds I decided to go and see if the promised overnight snow had fallen. I knew before I parked my car that it had. The clouds lifted and broke as I drove up Strathspey, revealing mountains bright with fresh snow. In Coire Cas the wind was strong and bitter. The climb warmed me up, especially as the new snow was soft and in places deep where the wind had blown it into big drifts. Underneath the old snow was hard and smooth and the rocks were glazed with ice. Reaching the Cairngorm Plateau the full force of the southerly wind hit me, bringing clouds of spindrift, and I cowered behind a big cairn while I donned more clothing. No sign of spring up here. 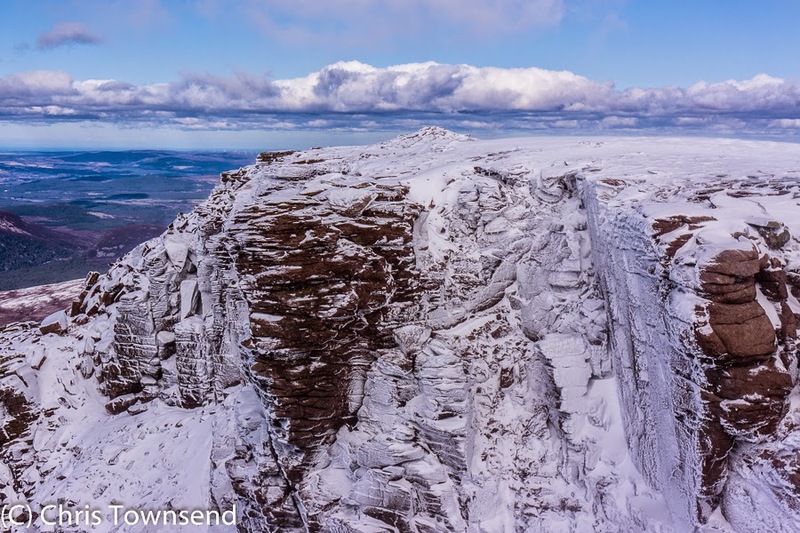 The Plateau stretching out to Ben Macdui was almost completely white. 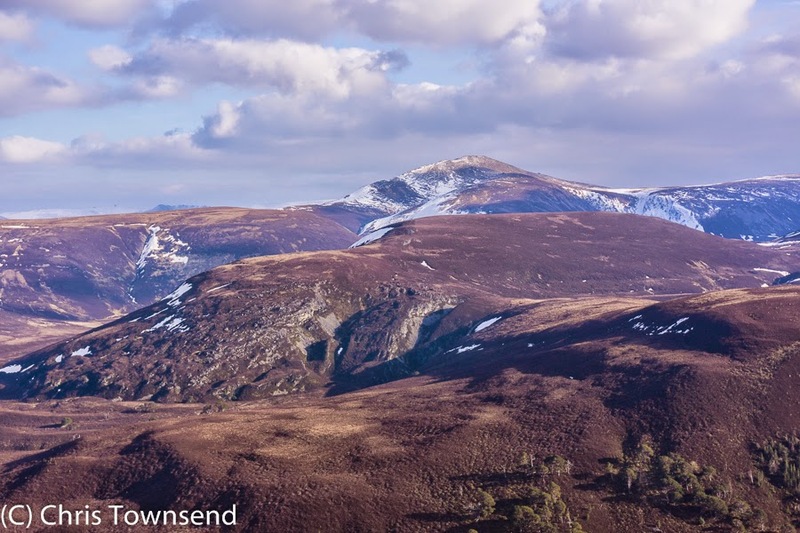 Across the green and brown of Glen More Meall a’Bhuachaille was snow-capped again. 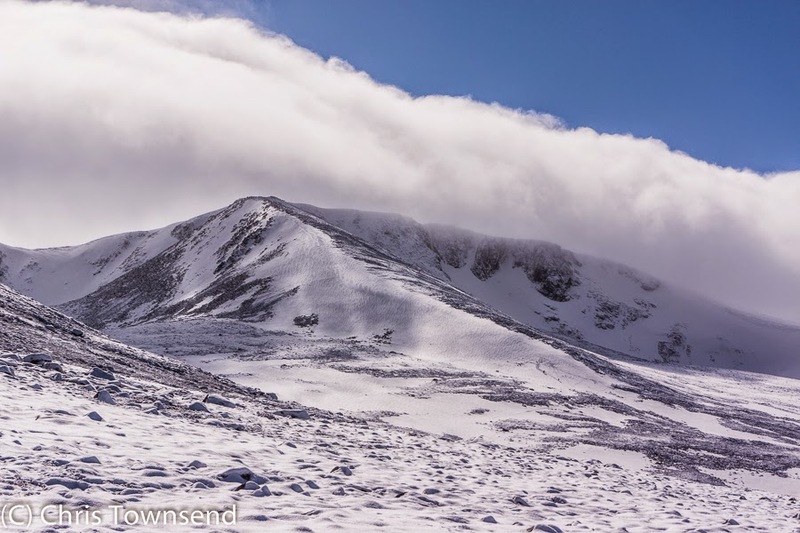 I followed the rim of the Northern Corries over Stob Coire an-t Sneachda and Cairn Lochan. Climbers were at work on the frozen cliffs and I heard them calling above the wind and the occasional crack of an ice axe. Clouds came and went along with flurries of spindrift, casting shadows over the hills and changing the light constantly so the world seemed fluid and mobile. Visually it was wonderful – ideal for photography. Physically taking pictures was difficult though. Holding the camera still in the wind, managing the controls with thick gloves on – my fingers quickly went numb when I tried removing them, constantly wiping spindrift out of the lens. Lying down was good for stability but there was almost constant spindrift at ground level. Crouching or leaning on boulders were a good compromise. 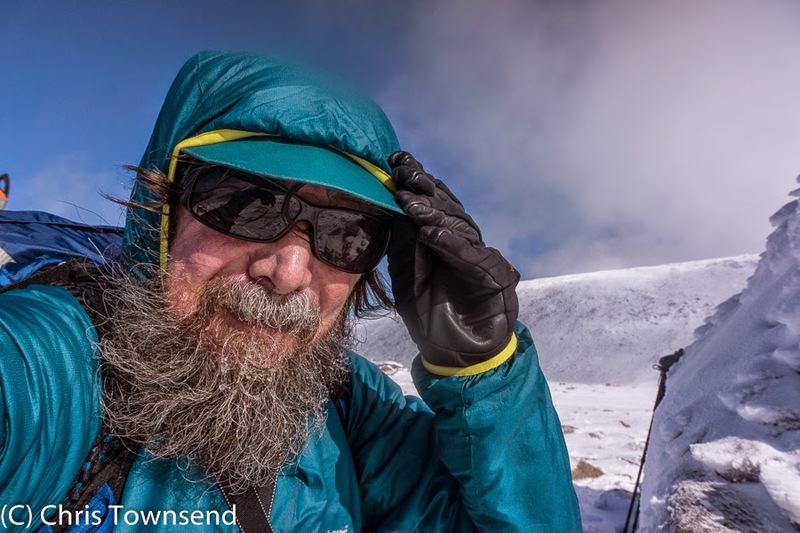 The wind chased me down the west shoulder of Cairn Lochan and back across the mouths of the corries to Coire Cas. 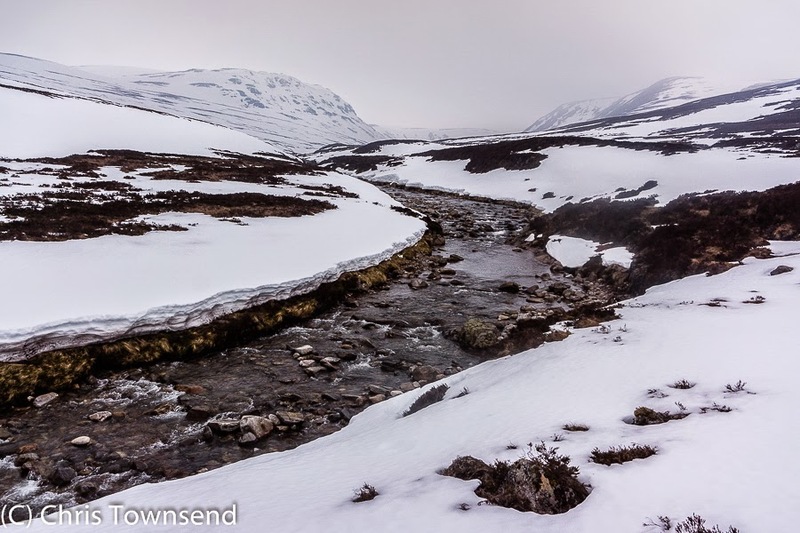 The streams were running out of the corries but there were still solid snow bridges across them. On the way home I paused at Loch Morlich to look back across the blue waters to the shining white mountains. A few hours later clouds covered the summits and have remained there since I returned home some thirty or so hours ago. Down here it has rained. Up there I expect there is more snow. 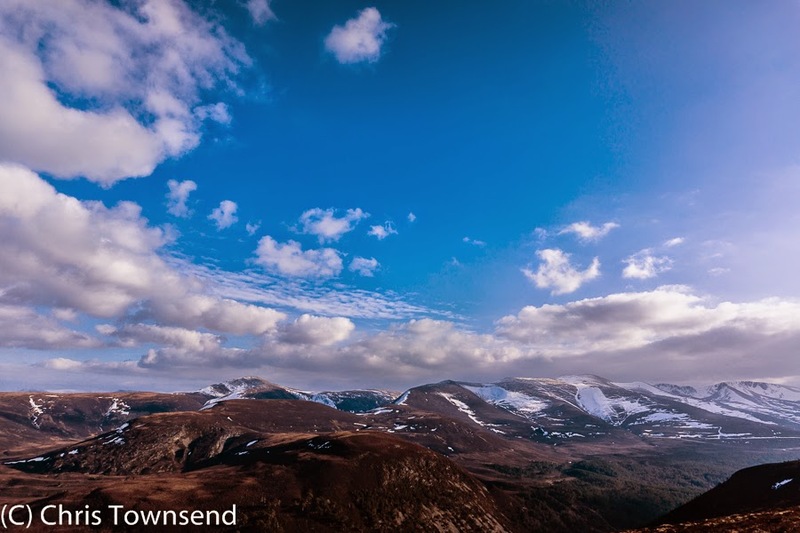 Not having been to one of my favourite places in the Cairngorms yet this year I decided to pay an overnight visit to Glen Feshie a few days ago. My rough plan - amenable to alteration or abandonment due to the weather, my mood or just a random whim – was to walk through the glen and camp somewhere beyond the forest for a change (I love camping in the big old pines but sometimes it’s more interesting to do something different) and then make a way up onto the Moine Mhor plateau and cross this back to the lower glen, a circuit that would make a long day but in this case would be split into an evening and a day (the actual walking took ten hours in total). The weather forecast wasn’t wonderful but it wasn’t terrible either. No storms were predicted, nor was any sunshine. The tops should be clear of cloud though and the only rain was meant to fall during the night (and it did). As it was, due to various delays, it was only an hour before dusk when I set off on a calm evening with an overcast sky. Dribbles of drizzle trickled down on and off as I wandered up the glen, enough to occasionally have me pulling up my windproof jacket hood but never enough to have me putting on my waterproof jacket. By the time I was entering the old pine woods around Ruigh-aiteachan it was quite dark. The path was wide and firm though and I could see well enough so my headlamp stayed in a pocket. The trees became silhouettes, clumps of bushes dense blocks of blackness. An owl hooted softly away in the trees. The only sound was the rush of the snowmelt swollen river. The path began to narrow and climb as the always meandering river curved in towards the bank. I pushed through invisible bushes, feeling them brushing my clothes and pack. As the slopes eased I saw a red light off to the side and then a faintly lit tent. I strode past, lifting my trekking poles without thinking so they didn’t click on any stones. Although early the darkness and quiet made it seem late and I felt I shouldn’t disturb the tent’s occupant. The path rose again onto steeper slopes and crossed some washed out gullies. I was aware of steep slopes falling away to my left into darkness with only the white-flecked tips of waves in the river showing that anything lay below me. I kicked a large rock then tripped on a trailing root. It was time for the headlamp. I switched it on and the world changed. The wide beam illuminated trees and rocks in a circle of pale light outside of which all was now solid black, the vague shadows and shapes of trees and rocks gone. Walking on I left the forest for heathery flats fading into distant slopes. I’ll camp soon I thought. A side stream rushed down to join the Feshie. My light picked out a few trees along its banks and some steep rocky slopes nearby. A flat area recently washed by snowmelt and flood invited a camp. The waters were fairly low now. I didn’t think the area would flood again. As I pitched the tent the drizzle finally turned into real rain. Perfect timing, I thought, thought aware it was nothing to do with me. 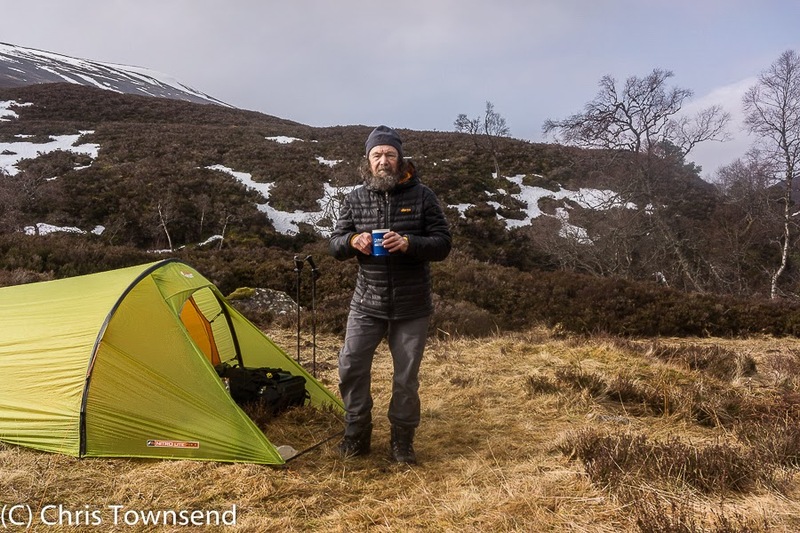 Inside the tent lying half in my sleeping bag and with water heating on the stove I enjoyed again the familiar pleasure of listening to the rain beating on thin nylon walls whilst warm and comfortable inside. Although I quickly worked out from the map that I was camped by the Allt Coire Bhlair I didn’t know just what I’d see the next morning. That’s one of the joys of camping in the dark, waking to a world you haven’t seen before but which you are already immersed in. Dawn showed the site to be delightful. The Allt Coire Bhlair poured out of a narrow rocky ravine with little trees hanging on every tiny patch of earth then ran into the River Feshie, itself racing between stony banks and overhanging trees. Steep heather slopes rose to distant snowy tops. I stayed a few hours. It was too good a place to rush off. 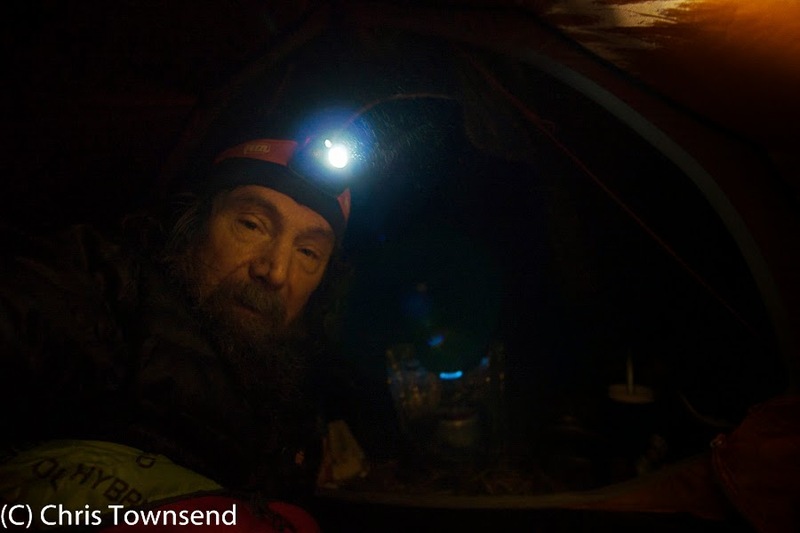 A heavily laden backpacker came up the track – the camper I’d passed the night before, I guessed – and waded straight through the shin deep stream. I’d rock hopped the night before but I had trekking poles and he didn’t. He came over for a brief chat and then vanished up the glen. I saw no-one else all trip. Finally moving on I followed the now moorland glen to the River Eidart. Not much farther on the Feshie doubles back on itself and heads into some really remote little-visited country. I hadn’t time to go there this time. Continuing east I would come to a very narrow and shallow watershed (the map shows no contours) and then the Geldie Burn. I didn’t go that way either. Instead I turned north to follow the long River Eidart right into the heart of the great Moine Mhor plateau. 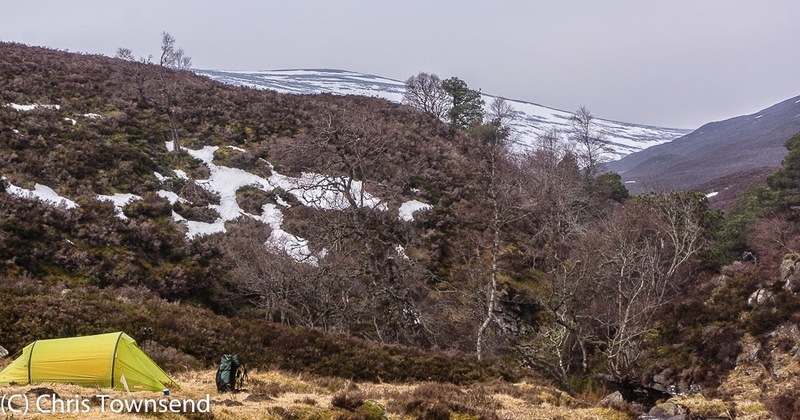 Guessing, rightly, there would be more snow on the western side where the slopes were protected from the sun and the south-westerly winds that had brought the big thaw a few days earlier I crossed the narrow Eidart Bridge and made my way up the east bank. There’s no path but the route-finding is easy – just follow the river. Gradually the moorland slopes steepened and became more mountainous. The glen narrowed, more and more snow appeared. High above big cornices rimmed the steep walls of Coire Mharconaich. After nine kilometres the Eidart splits into two feeder streams. One, the Allt Luineag runs down some five kilometres from high on the flanks of Braeriach. 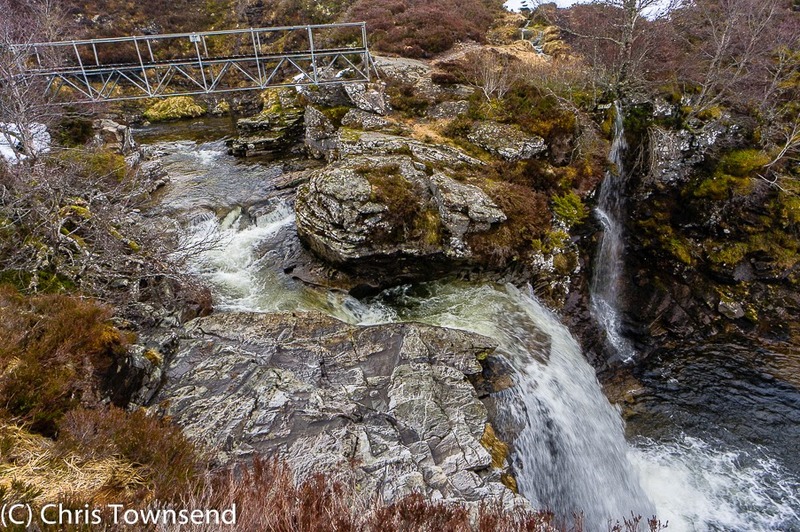 The other, my stream today, the Allt Sgairnich, descends four kilometres almost from the summit of Carn Ban Mor. Coming out of the lower narrow Allt Sgairnich glen I suddenly found myself in the middle of the Moine Mhor, somewhere that from any other direction requires crossing a large expanse of high ground. I knew I would arrive here. It was still a shock. I didn’t feel as though I’d climbed up here yet here I was. The weather was a surprise too. 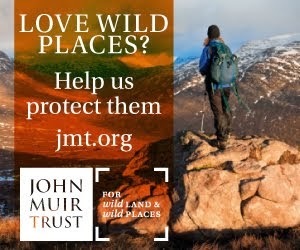 I’d assumed there would be a wind once I left the protection of the deep glens. It was absolutely calm. 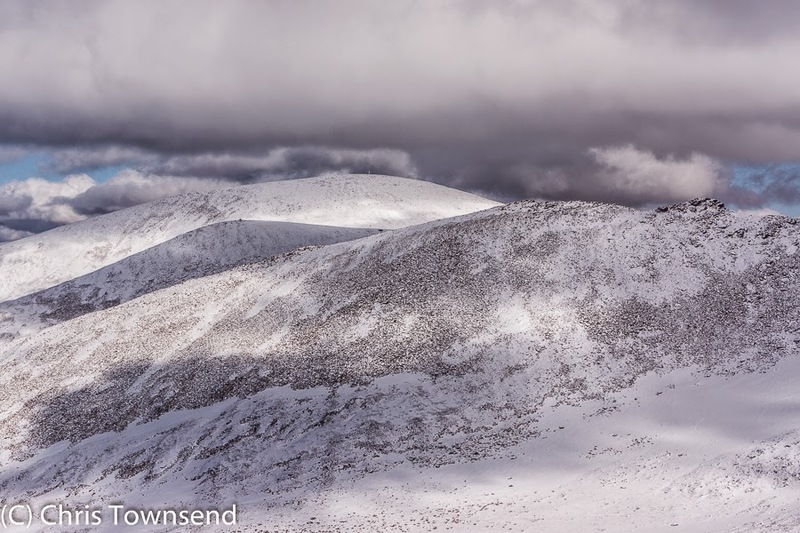 A thick grey cloud lay not far above, covering the summits of the highest hills, Braeriach and Cairn Toul. Across the white expanse of the Moinr Mhor I could see the hazy pointed summit of Sgor Gaoith. It didn’t seem quite real. The whole place didn’t seem quite real. Standing still there was no sound. No wind, no running water. Moving my boots crunched in the snow. Sweat trickled down my back, down my arms. What is this weather, I wondered? I searched for a word. ‘Muggy’ appeared in my mind. Yes, it was muggy. No, part of my mind objected, it can’t be. Muggy is for horribly humid hot summer nights not for a snow-covered mountain plateau in March. But muggy it was. I crossed the snowy expanse towards Carn Ban Mor. The cloud thickened. Visibility faded. A compass bearing was needed to find the start of the path back down to Glen Feshie. On the edge of the plateau there was, briefly, a breeze. I was back down at the car some 25 hours after I’d left. I thought about the trip. Enjoyable, yes. Interesting, yes. But also unusual.